Inventory We are a resale marketplace, not a box office or venue. Ticket prices may exceed face value. This site is not owned by Sprint Center . Sprint Center is a large, multi-use indoor arena in downtown Kansas City, Missouri. The building is located at 14th Street and Grand Boulevard, on the east side of the Power & Light District. The arena's naming rights partner is the telecommunications company Sprint, whose headquarters is in nearby Overland Park, Kansas. Sprint Center opened to the public on October 10, 2007, and a concert on October 13, 2007 by Elton John was the first event held at the arena. The arena seats over 19,000 people and has 72 suites. Sprint Center has effectively replaced Kemper Arena, which was built in 1974, just a few miles away in the southern portion of the West Bottoms. 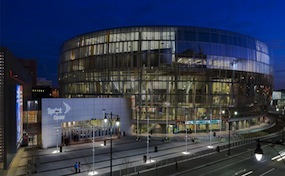 Additionally, the College Basketball Experience, which includes the National Collegiate Basketball Hall of Fame, is connected to and located directly north of Sprint Center. CenterKansasCity.com is a privately held company that specializes in the sale of tickets in the secondary market. We are not affiliated with any official supplier or box office. To purchase tickets to any Sprint Center in Kansas City events simply call our operators at anytime or click on the event you wish to attend.